1. 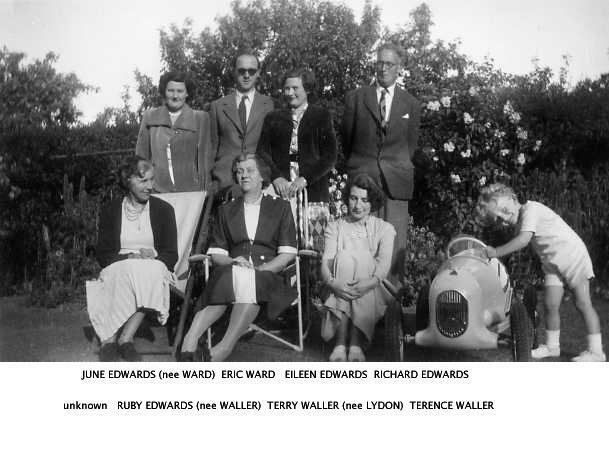 Richard John EDWARDS, son of Richard EDWARDS ( - ) and Rose BUNTING ( - ), was born on 28 February 1885 in 14 Bingfield Street, Islington, London. He was a Carpenter/Builder. He married Ruby Charlotte WALLER on 7 January 1914 in St. George's Presbyterian Church, Willesden Lane, Brondesbury. He died in 1968. The following gives a small insight into the mind of Edwards. In a family scrap book there is an entry, dated 10th March 1912, made by R.J. Edwards (most likely Richard John), in which he copies a poem entitled "Disarmament" by J.G. Whittier. This poem is a passionate call to pacifism: ""Put up the sword! ", the voice of Christ once more speaks in the pauses of the cannon's roar" it begins; and finally ends: "and peace unweaponed conquers every wrong". It is a sad irony that within two years Britain would already be involved in the carnage of World War I - it would be interesting to know what Edwards did - he survived not only this war, but also World War II, dying at the age of 83 in 1968. 2. Richard EDWARDS married Rose BUNTING.